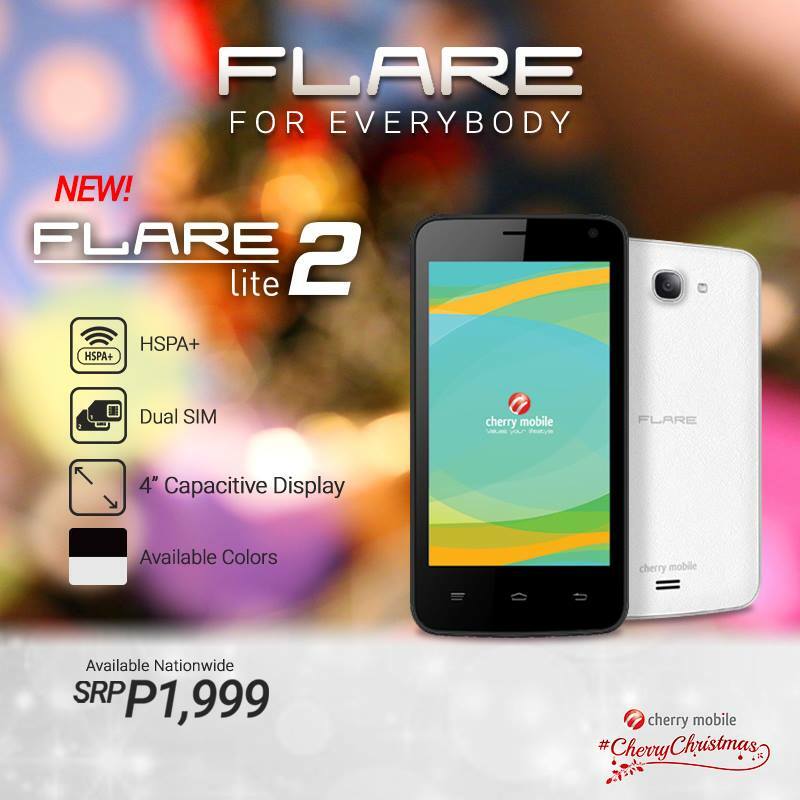 Cherry Mobile Flare Lite 2 Price is Only Php 1,999 : Great For Budget-Conscious Young Consumers! Cherry Mobile quietly launched a number of entry level Android smartphones last week, just in time for their loyal fans' 2015 Holiday gadget shopping! Selling for only Php 1,999, Cherry Mobile Flare Lite 2 is currently one of the company's most affordable full touchscreen handsets running Android operating system, allowing consumers who are on a tight budget to enjoy the benefits of owning an actual smartphone instead of a feature phone without having to spend a whole lot more. Frankly, this model's technical specifications are pretty much similar to that of competing handsets from CM's biggest rivals in the local handset game; To be specific, Starmobile Play Club and MyPhone my25. On the outside, it flaunts a 4-inch WVGA display panel, 5 MegaPixel rear camera with single-bulb LED flash, and a 2 MegaPixel front cam for selfies. Inside, this 3G HSPA+ enabled device is powered by a 1.2 GHz Quad Core processor from Spreadtrum, has 512 MB of RAM, and 4GB of expandable storage. We've yet to check the exact battery size but I believe it should be around 1,500 mAh. While Cherry Mobile Flare Lite 2 is by no means a powerhouse model, I think it's an amazing release in the sense that it democratizes the Android experience. With it, Cherry Mobile was able to prove that users don't have to spend more than Php 2,000 to be able to incorporate the features of this OS - Android 4.4 KitKat, to be specific - into their daily mobile experience. And as a Pinoy technology blogger who's always on the side of consumers, that's something that I really appreciate. Dual SIM (two microSIM slots) Dual Standby Cherry Mobile Flare Lite 2 is now available nationwide. Right now, it's out in just two colors: Black and White.